If you had simply asked me what kind of adaptation I would’ve liked to see created from one of my favorite shows, an opera would certainly be the last item on my list. Not necessarily for distaste of the form, but with general ignorance toward its many splendours. Yet Sung Jin Hong of One World Symphony had me convinced within a few moments of his Hannibal opera that it fit the exquisite television series perfectly. 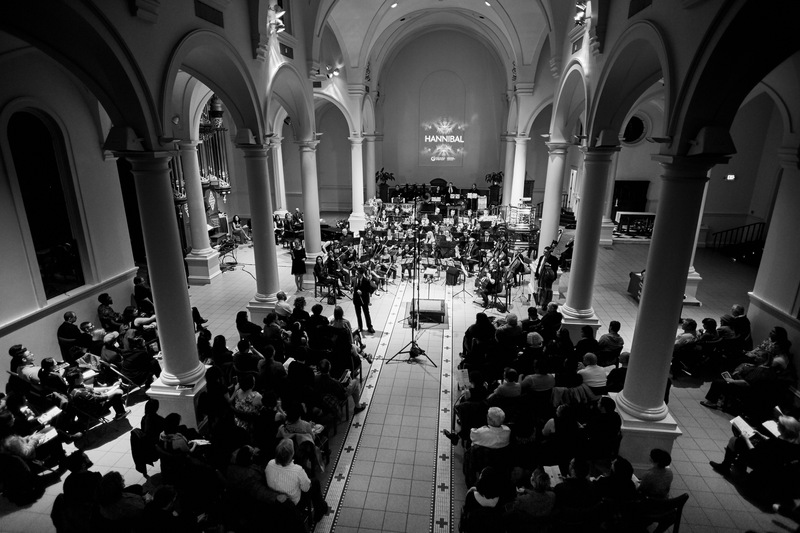 The event on Sunday night at the Church of the Holy Apostles in New York City began with four introductory pieces, all classical in form and bearing some close resemblance or connection to Hannibal. I considered them something like warm-ups, preparing our ears (and eyes, in some cases) for the journey we were soon to undertake. Each piece worked to lull me into the contemplative attitude I often adopt when actively trying to pay attention to music. They were haunting, beautiful, and at times, quite loud and jarring; each worked to build suspense on almost an unconscious level – much like the show. Sung Jin Hong, the composer and director of the Hannibal opera, stood to introduce himself to the crowd once the first four pieces were complete. He asked a few questions, including one to the affect of how many of us were first timers. I raised my hands immediately, noting I was among maybe ten or twenty others. He then asked who among us were Fannibals, and I was delighted to see more than half of the crowd raise their hands. As he went on to play selected sections of his opera and explain their composition, I realize I felt more comfortable from the acknowledgement alone than I had the entire night. Much less like a fish out of water, and more like a welcomed fan in a new fandom. The main event consisted of three parts and essentially five scenes. I was delighted to find that the characters of Hannibal, Will, Abigail, and Mischa (Hannibal’s sister) were all present and even resembled their characters from the show. 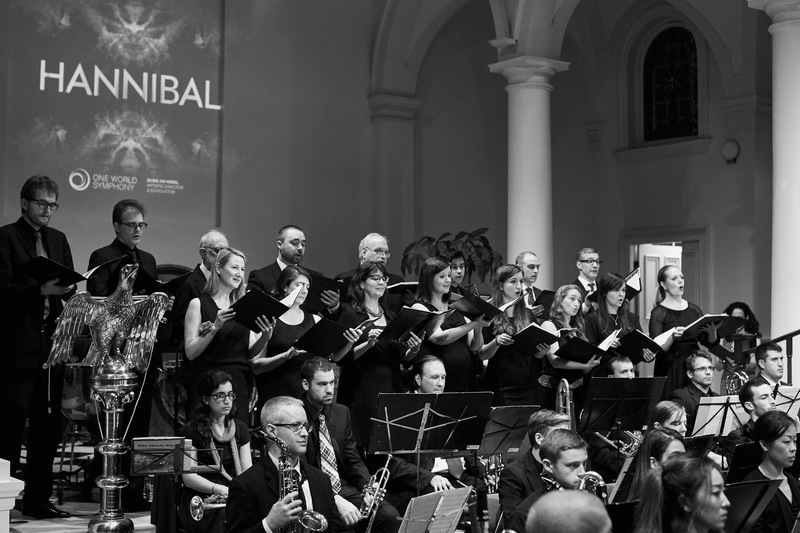 The opera followed the events of season one, delving into the depths of Hannibal’s mind and taking Will, as well as the audience, along with him. Part one focused on what exactly turned Hannibal into a cannibal. Mischa stood in the pulpit of the church, calling Hannibal’s name while the woodwinds in the orchestra, a tribute to Hannibal’s victims, cried out in what seemed to be despair and sadness. Hannibal drifted through the crowd (and I bounced excitedly in my seat) as the music continued, carrying us through his nightmares. 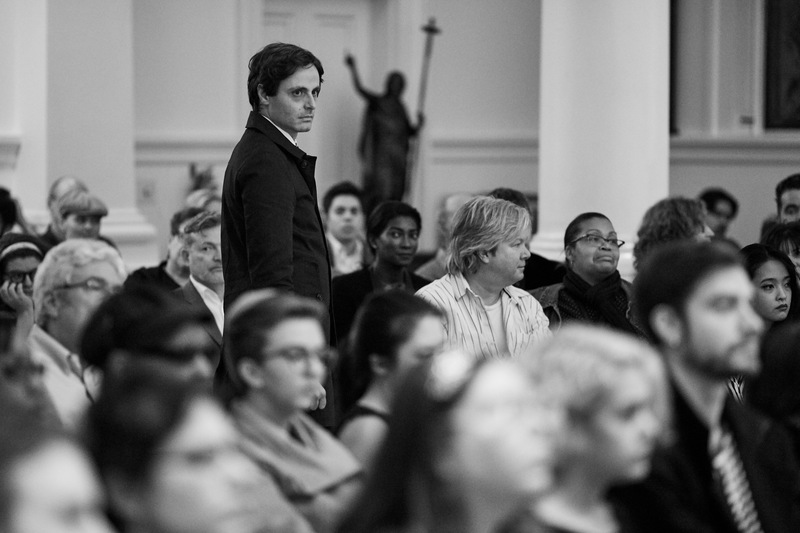 Countertenor Nicholas Tamagna performing the title role of Hannibal. A chorus of voices joined at the end of the scene to whisper an accompanying poem that Sung Jin Hong included. The voices felt vindictive and accusatory, as though they were watching the deep trap Abigail and Will were falling into with judgemental glares. Yet we know, whether fans of the show or not, that they will continue to remain at Hannibal’s mercy. Scene three showed Abigail’s distress over confessing her transgressions to Will, expressing her worry and despair to Hannibal. This section included a highly anticipated moment for me, in which the “symphonic image of Hannibal’s Ravenstag” would appear. Alas, my ears were not equipped to pick up such nuance, and I was upset that I missed the allusion. From my seat at the side of the church, I could not see the display on the screen, so much of the words and dialogue were beyond me as well. Thankfully, these are the only problems I had with the production as a whole. Part three found all of the characters in the main space to interact for the final scene. The music comes to a crashing conclusion and the story reaches its climax, depicted excellently through what I learned were “piano clusters” (props again to the brilliant program). Will rushes to Hannibal’s house and finds Abigail alive, and is barely able to overcome his surprise before Hannibal stabs him dramatically in the stomach. He asks for Will’s forgiveness as he slashes Abigail’s throat and she dies before them. It may seem like a strange, ridiculous scene to an outsider – but as a Hannibal fan, I was ecstatic. Each of the singers fully committed to portraying the interaction perfectly, miming the violent acts as well as the tender gazes between each character. My favorite part of the night was Sung Jin Hong capturing the essence of Will and Hannibal’s relationship and true connection: Hannibal, the perfectly crafted and composed killer, allows Will Graham to truly “see” him. A piano solo drifts through as Hannibal speaks these words, and I was completely entranced. I realized in that moment that not only did I want to see the rest of the show enacted in this exact fashion, but I missed the show terribly. I was incredibly sad, but for the best reason. Throughout the evening, I found what the program described as the “dichotomy of traits” of humans illustrated perfectly. The music followed what seems to be the contradicting nature of Hannibal: his supreme elegance, high-brow character, and devotion to the profound. Everything about his character is calculated and presented carefully, from his pristine suits to his perfectly arranged meals. The music played for us displayed the kind of beauty that can often accompany supreme and even violent madness. It led us through Will’s descent into Hannibal’s mind, through the depths and darkness as it captured Abigail, and back to the surface once more. From a removed perspective of a viewer (or in this case, a listener), the workings of Hannibal’s twisted mind is an amazing thing to witness, and Sung Jin Hong’s Hannibal Opera made it an incredible thing to experience in musical form, as well. More information on One World Symphony can be found on their website. 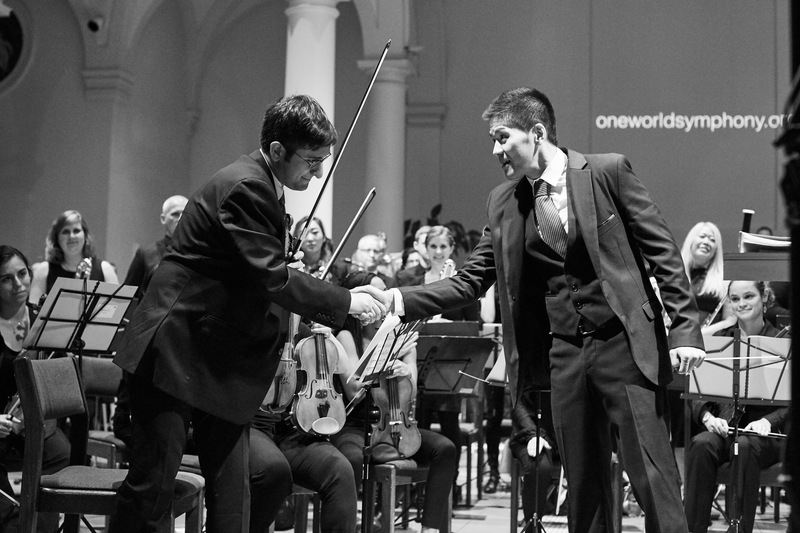 Many thanks to One World Symphony for the photographs of the event taken by Jaka Vinsek. Chelsea Moquin is an aspiring screen and television writer living in Brooklyn. During the weekdays, she works at a production company in Manhattan, though in her off-hours she is a full-time fangirl and fanfiction enthusiast. 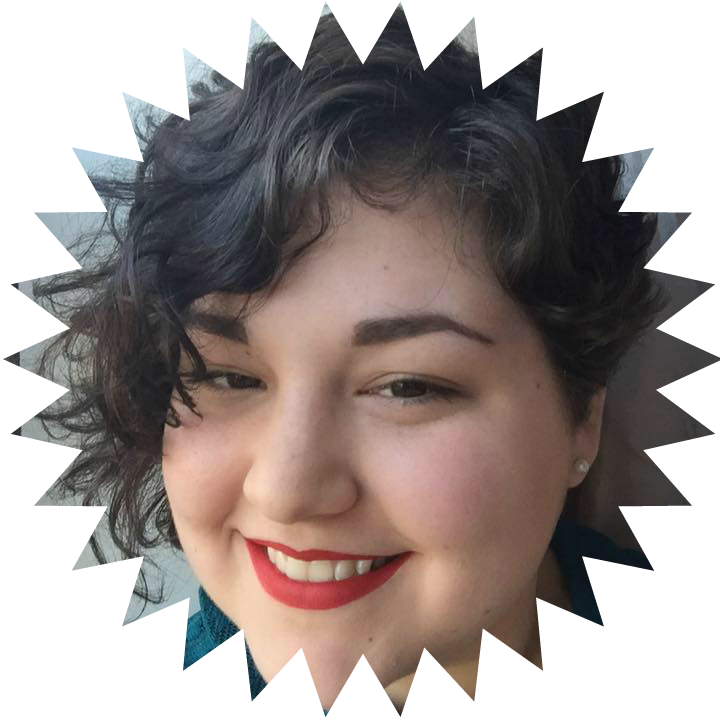 She is a member of the Three Patch Podcast and devotes the rest of her free time and energy to all things Sherlock Holmes and/or Benedict Cumberbatch related. You can reach her on twitter, tumblr, or explore her website at chelseamoquin.com. 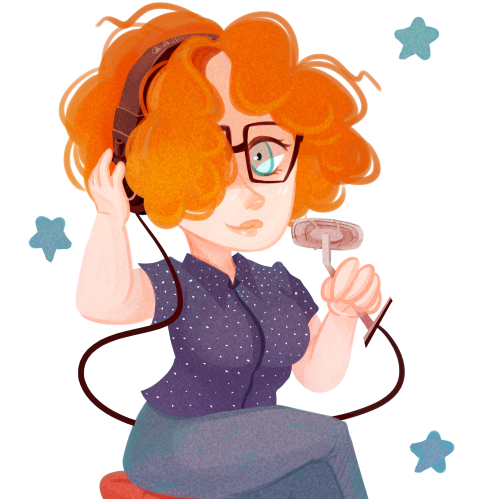 If you would like to guest post for Very Nerdy Curly, please get in touch!